Communist states, for many years, were able to claim an impressive record of social and economic achievement. They had high rates of economic growth, but low levels of inflation and unemployment. They had high educational enrolments and comprehensive welfare programmes; they had low cost housing and comprehensive health services. There were few, however, who argued that they had made a comparable contribution to the field of politics, or to the enlargement of human liberty in particular. It had been supposed by Marx that, broadly speaking, once capitalism — the last of the class-divided and exploitative societies — had been abolished, there would be no more need for a separate sphere of political administration and the state would (in Engels’s celebrated phrase) ‘die out’. In the communist states, however, there was little sign of a process of this kind (some unkindly suggested that the only thing that had withered away was the idea that the state should wither away). 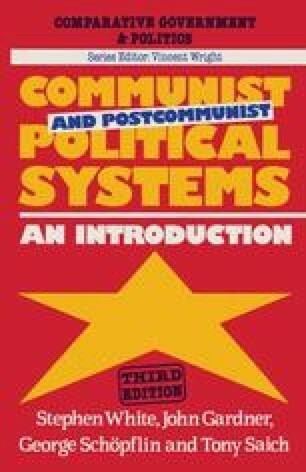 The communist states, on the contrary, were large, powerful and authoritarian institutions throughout the 1980s, in which the rights and liberties of the citizen, at least in Western terms, were systematically repressed.